Congratulation to Linda who wrote, "I love the pincushion, it reminds me of fall my favorite time of year, I love fall crafts". She is the winner of this month's Common-Thread Give Away Drawing. I will email Linda as well to inform her of being our winner. I want to thank all of you who signed up. I loved reading your feedback, which varied from nice complements of my work, which are always welcome, to interesting bits about your lives and how you related to this piece. If you didn't win, know that we have a monthly drawing each month starting on the first Monday. It is our way of thanking you for following our blogs and artwork! 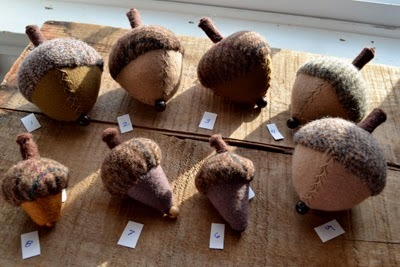 Also at the end of this blog, please see acorn pincushions available for purchase. They are not listed in my Etsy shop as yet, but just contact me if you might be interested in purchasing one. It seemed that an acorn was a good choice for this give-away! My readers wrote wonderful things from Acorn being a favorite name of a horse, to my pincushions inspiring someone to make their own pincushion and is now into quilting like myself. A newly retired nurse of 46 years wrote that she needed it to hang above her mantle to bring health and wealth to her household. Another wrote that she has an acorn collection consisting of jewelry and a trivet and still another wrote that her mother had an acorn pincushion which she wasn't allowed to play with, despite being tempted. Some wrote how they would share it with a sewing friend, and still another suggested I use a similar pattern to create a mouse, chipmunk or a vole. Great idea to be sure! One woman commented that she would like it as acorns and squirrels make her think of her little brother that she lost a couple of years ago. He and her father had loved to feed squirrels and where there are squirrels there are often acorns. I was particularly touched by this entry as I lost my younger brother at age thirty-three and I too have associated various symbols to him as well as to other relatives that have passed. She didn't know but actually the making of this acorn is closely related to squirrels. In my blog in June 2014, Beautiful and Delicious, I received word from Emmett McCarthy, that one of my tomato pincushions that he had given to his good friend and children's illustrator, Lisa Zador, had just been eaten by a squirrel in her NYC apartment courtyard. She had it sitting on the windowsill with her window open and a courageous squirrel tore through the screen to get to the pincushion. She caught him sitting in a tree outside of her window eating it. She hadn't known that it was filled with crushed walnut shell filling. 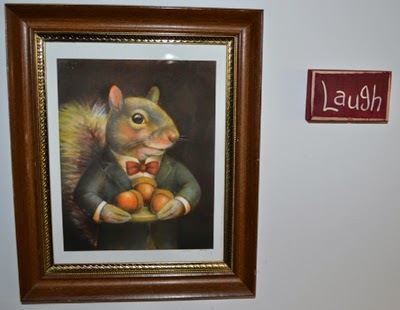 Lisa Zador's squirrel portrait. check her Etsy Shop, Curious Portraits. Another Squirrel Portrait by Lisa Zador. Emmett was laughing as he wrote, "your pincushion isn't just beautiful, it is delicious too!". Lisa sent me the picture of this bold squirrel munching down the pincushion. 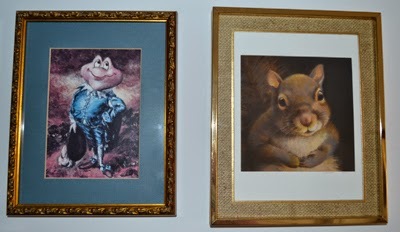 I replaced her pincushion and another besides, and she in turn sent me two squirrel portrait prints that she had done, that are now hanging on my family portrait wall. (Do check out her Etsy Shop, Curious Portraits). 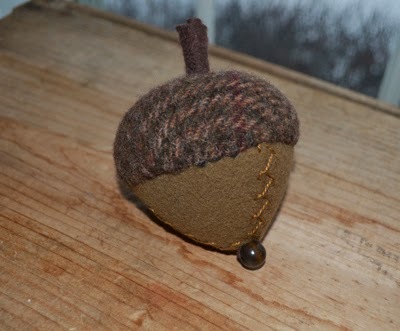 An acorn pincushion was then ordered by Emmett as a birthday gift for her. This is how my first acorn pincushion was created. This same woman asked if she could purchase a wool acorn pincushion, if she didn't win. 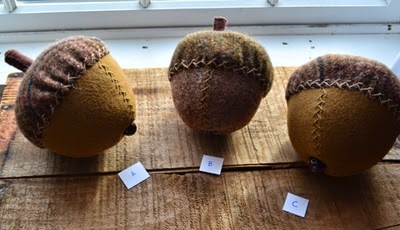 So I have taken the following pictures of acorns that are currently for sale, though they haven't yet been listed in my Etsy shop. Just email me at jmcvermont@comcast.net and let me know which one(s) you might be interested in and I will send you full details. The prices range from $12 to $28. These larger acorns are for sale. Please contact me if interested. These are the smaller acorns and are for sale. Contact me if interested. Another person inquired as to whether or not our Common-Thread Art Group was a community of needlework women? Actually, we are all writers and artists. We all have blogs and most of us sell our work on line. Our arts include needle-craft arts, but we also have artists of different mediums, including photography. Jon Katz is part of our group, as is his wife, Maria Wulf, and thanks to their well-followed blogs and books, our writings and art work have been shared with many more readers than they otherwise would be exposed to. We mostly live in Vermont and upstate New York, and have met through craft shows, as well as writing classes. Likely any like-minded sort of group could be formed for the purpose of supporting each other. I feel fortunate to be in such a group. Again, thank you all for visiting our various websites and we hope that you will continue to visit us. Don't forget that February is coming soon and we will have another give-away to thank you for following our blogs and work!